Peer to Peer (P2P) loans is an innovative and unconventional option for borrowers seeking a personal loan. Many factors have led borrowers on a narrow time-frame to look at atypical financing options, such as high interest rates, and an inflexible and time-consuming process in traditional debt-financing. P2P lending platforms are basically online marketplaces. This means the application process is fast and easy. Borrowers who need the loan urgently don’t have the luxury of time to wait around for lengthy bank application processes. Most P2P marketplaces also have a ready base of lenders. The online matching process facilitates an automated matching of the borrower and lender, leading to faster turnaround time for the availability of the loan. As a borrower, you have the definite advantage of availing loans at a lower interest rate than banks and other lending institutions. 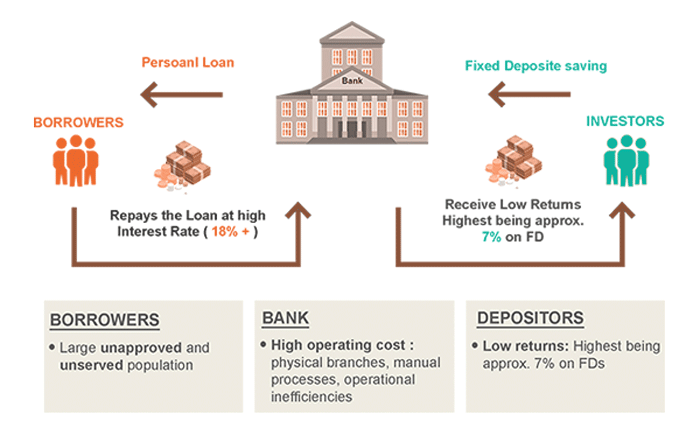 Since lenders use an online platform to provide the money directly without any intermediary, the transaction is mutually beneficial to both the borrowers and lenders with favorable interest rates. Moreover, P2P lending platforms also don’t’ levy the additional fees and charges that banks do, making it a win-win proposition. 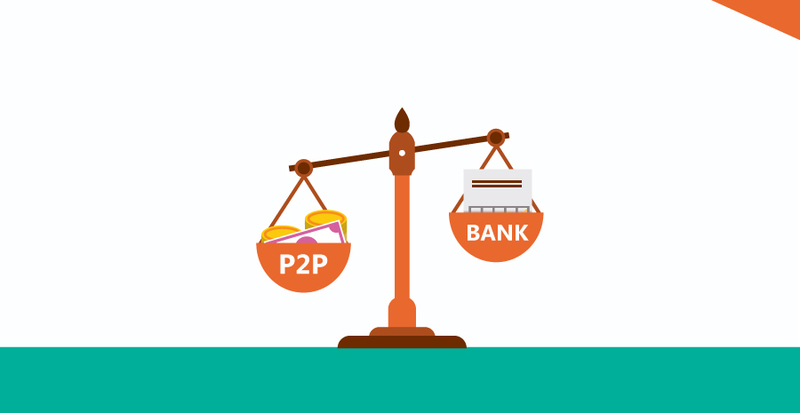 P2P lending might also be ideal for you if you may not be eligible for a bank loan due to their rigid and strict evaluation process for applications. Banks have a narrow and conventional approach to gauge the creditworthiness of an applicant. This makes it an inaccessible platform for many deserving candidates who may not fit the bill conventionally. The credit scoring models offered by P2P lending platforms is quite unique. Where banks use the standard credit rating agencies as one of the main criteria and source for information on the borrower’s eligibility, the credit score is only one of the several parameters in the grading system designed by most P2P platforms. 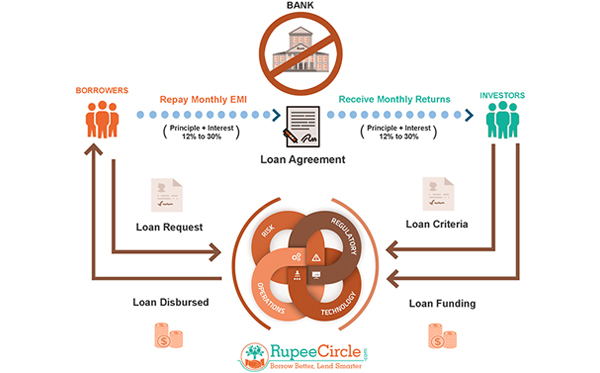 Some factors that P2P lending platforms use include credit score, population registry, employment history but also non-traditional information like data analytics, social modeling, cash flow, and repayment record etc. This is useful for the borrowers because it creates an uninterrupted experience for them that gives instant feedback on their loan application. Getting a personalized quote doesn’t affect your credit score if you are seeking a loan. This means you can research the rate and viability of a prospective loan, compare and contrast without worrying about your credit score. For your initial research, P2P platforms only conduct what is known as a ‘soft search’ on your credit history. This doesn’t show up in future searches by other finance providers and doesn’t hamper your credit score. The entire process of application and approval is digital. Other than a one-time physical verification for residential proof, the process is paperless and carried out online. You can accomplish all the steps using your mobile device, be it scanning documents, signing them and uploading them. Compare this to the traditional banking process, and you will immediately see how efficient and convenient this is. One key challenge for first-time borrowers is to access banks where they may not have an account. But in the case of P2P loans, once your borrower profile is rated and uploaded, you have access to a large number of lenders on a single platform. Some P2P lending platforms offer not only finance but also a forum to find more information and advice. There is a sense of community and you can tap into the knowledge base and resources available or find out more about borrowing and lending experiences. Often banks and lending institutions charge a penalty for early settlement of loans. There is no such pre-closure penalty in case of P2P platforms or only a nominal prepayment penalty in case of some platforms. This motivates you to repay your loans early and manage your finances better without worrying about being penalized. Moreover, with fixed interest rates and low monthly payment rates that have no hidden fees, borrowers are at a highly advantageous position. In conclusion, P2P lending provides easy and quick access to funds, at a lower cost than banks, funded with less hassle, with a more flexible scoring system and ease of repayment, making it a very attractive and viable option for borrowers.